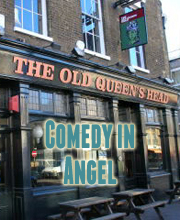 Laugh Out London presents a day of Edinburgh Festival previews from Sam Simmons, Sarah Kendall, Goose and Nick Helm as part of the Laugh Out London Comedy Festival at the Old Queen’s Head in Angel. Please note these are work-in-progress shows. The day will be hosted by the awesome BEC HILL (“An innovative talent” -★★★★ Time Out). Winner Foster’s Edinburgh Comedy Award 2015. Winner Barry Award 2015 Melbourne International Comedy Festival. From the brain that brought you millionaire cats eating Viennetta, gypsy cuddles and nanna wanks, comes a brand new hour of mind-blending internal self-hatred, paranoia and comedy – because you have to put comedy in it. ‘This really is Simmons at the top of his game: exhaustingly funny, daft and truly daring’ ***** (Time Out). ‘This show both demands your attention and deserves it’ ***** (Times). ‘Fabulous, breakneck performer who morphs feverishly between characters and ideas’ (Independent). ‘One of the hottest tickets in town’ **** (Herald). ‘Hugely impressive’ **** (Mirror). ‘You just have to submit to this force of nature, until it deposits you, dizzy but exhilarated’ **** (Chortle.co.uk). ‘One to watch’ **** (Time Out). ‘A work of theatrical mastery and comic innovation’ **** (Fest). ‘Fast-paced, tightly-written and technically brilliant’ **** (Skinny). The Foster’s Best Comedy Award 2015 nominee and Comics’ Choice Award winner returns with a brand new hour of masterful storytelling. In 1989, a major earthquake hit Sarah’s small hometown. This disaster provides the backdrop for Sarah’s tale of lies, stalkers, buried truths, false accusations, simmering tensions and overpriced sausages. ‘Knocked the wind out of my sails’ ***** (Herald, UK). ‘Truly brilliant’ ***** (Chortle.co.uk). ‘A gripping experience’ **** (Guardian). ‘Kendall is a dextrous storyteller, dancing around dark moments, then skipping straight back to punchlines’ **** (Times). Please note, Nick is not taking a show up to Edinburgh but will be doing an hour of work-in-progress material.